Mama Witch stirs up a cauldron of special Halloween soup for her Picky Little Witch. 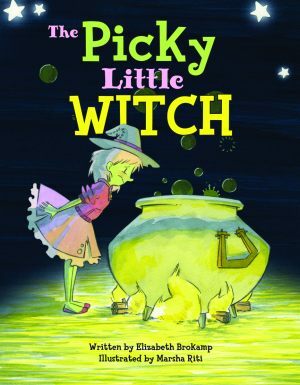 From a pinch of snail and salted rock to goblin tears and shower of soil, she tosses in an assortment of ingredients in an attempt to please her Picky Little Witch. After much coaxing, the tyke takes a bite and realizes that it isn’t so bad. When the two fly off for trick or treating, Picky Little Witch immediately sets her sights on such sweets as licorice snakes, coconut cakes, and caramel dandy. After much resisting, Mama Witch finally nibbles on a piece of candy and discovers that it is really quite delicious! 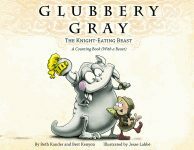 Complete with a recipe for Halloween Soup and humorous illustrations, this fun read addresses the subject of picky eating. Parents and children alike will enjoy this treat. Elizabeth Brokamp is a licensed professional counselor in private practice. Brokamp earned her BA from the College of William and Mary and her MA and EdM from Teachers College, Columbia University. Brokamp lives with her husband and three children in Alexandria, Virginia. Marsha Riti earned a BFA in studio art, with honors, from the University of Texas at Austin. She won the Portfolio Grand Prize at the Books, Boots, and Buckskin 2011 Austin Society of Children’s Book Writers and Illustrators Regional Conference. Riti enjoys gardening and cooking and lives in Austin, Texas.